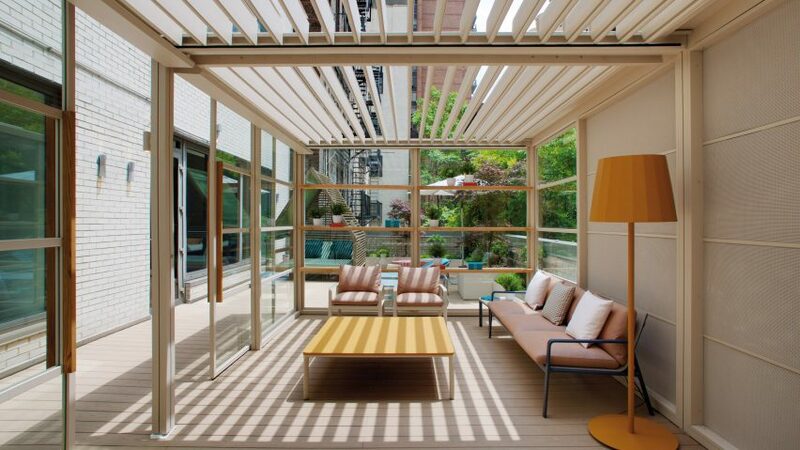 Spanish brand Kettal has opened a showroom in Midtown Manhattan, based on a design by Patricia Urquiola and complete with a terrace to better showcase its outdoor furniture. The open-plan showroom at 222 East 59th Street, in an annex of the D&D Building, totals 6,458 square feet (600 square metres). Kettal Studio modelled the space on the store that Milan-based Spanish designer Urquiola created for the brand in Barcelona, which opened this spring. Walls, floors and ceilings across the interior are kept white, allowing windows to bring light into the space, as well as draw attention to Kettal's colourful pieces. To break up the retail space, a series of sitting and dining nooks are intended to help make it feel more like a home. The store is partially divided with slatted walls that form intimate lounge areas. Various carpets and planters further break up the spacious interior. Another wall-like storage section is constructed from white steel-framed volumes, which display individual Kettal designs in stacks on top of each other. The New York showroom is completed with a decked outdoor patio, also decorated with Kettal pieces. Planted foliage acts as a buffer to the surrounding fire escapes and high brick buildings. Outside, a glazed wooden pavilion has been built to resemble a house extension. The area is decorated with a soft pink sofa and two armchairs, with an orange floor lamp and a yellow coffee table adding even more colour. Also on the patio is a daybed housed inside a slatted, gabled structure resembling a tiny house, with a cushion. Woven table and pod designs, and an outdoor umbrella fill the rest of the area. Colours of pink, blue, mauve, yellow and cream are incorporated throughout, in upholstered furniture and sturdier pieces. In one corner of the showroom, back inside, is a pavilion that appears as if outside. The nook is furnished with additional woven and wicker elements to showcase Kettal's latest designs. Nearby is a long work desk for prospective buyers, with sample textiles on the walls creating a technicolour board. Headquartered in Barcelona, Kettal has been producing outdoor furniture since 1966, which it manufactures in the Spanish town of Tarragona. The New York showroom joins its other brick-and-mortar locations in Miami, Barcelona, Marbella, Paris and London. The brand collaborates with well-known designers from around the world, including Doshi Levien, Hella Jongerius, Jasper Morrison, Konstantin Grcic. It has a long-standing relationship with Urquiola, who recently designed a series of side tables with interchangeable tops and bases for Kettall.